Innovator, educator and best-selling Author Richard Gerver has been described as one of the most inspirational leaders of his generation. He argues, however, that great leadership is about serving the needs of the people that work for you and rely upon you. The three core principles that underpin Gerver's philosophy are communication, empowerment and impact. With over a decade’s experience in non-profit governance, Yassmin founded her first organisation, Youth Without Borders, at the age of 16. She has since served on numerous board and councils, including the Council of Australian-Arab Relations and ChildFund, and also serves as the Gender Ambassador for the Inter-American Development bank. Yassmin has been awarded numerous awards nationally and internationally for her advocacy, including the 2018 Young Voltaire Award for Free Speech and Queensland Young Australian of the Year in 2015. In 2017, Yassmin created Mumtaza, dedicated to the empowerment of women of colour, and most recently founded Kuwa, a platform tackling cultural change around sexual harassment in workplaces. Birth: Yassmin Abdel-Magied is a Sudanese-born Australian mechanical engineer, writer and social advocate. She travels extensively, delivering keynotes on unconscious bias and leadership around the world. 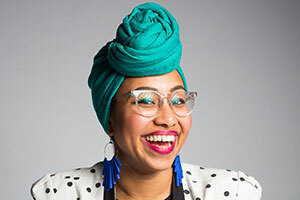 Author & Broadcaster: Yassmin worked on oil and gas rigs around Australia for almost half a decade before becoming a full-time writer and broadcaster in 2016. She published her debut memoir, Yassmin's Story, with Penguin Random House at age 24, then became the presenter of Australia Wide, a national weekly current-affairs show on the ABC and Motor Mouth, a podcast on becoming an F1 driver. After hosting the documentary, The Truth About Racism, she created Hijabistas for the ABC, a series looking at the modest fashion scene in Australia. Yassmin is an internationally accredited F1 reporter and a regular contributor to the BBC. Her writing has appeared in publications like Teen Vogue, The New York Times, The Guardian and numerous anthologies. Yassmin has also appeared at literary festivals around the world, including the Jaipur Literary Festival in India and Colorado, Hay Festival in the UK and the Dalkey Book Festival in Ireland. She is also a regular on The Guilty Feminist podcast, and has appeared as a co-host on the incredibly popular feminist show. Speaking: Yassmin has delivered keynotes in over 20 countries on unconscious bias and leadership. Her TED talk, What does my headscarf mean to you, has been viewed almost two million times and was chosen as one of TED’s top ten ideas of 2015. Not one to shy away from a discussion, Yassmin’s appearance on Q&A with former Senator Jacqui Lambie went viral, viewed over 12 million times in less than a week. In the debate, Yassmin challenged the orthodox conception of feminism in Islam and spurred on a global conversation about being a young Muslim woman of colour in the West today. She was amazing, inspirational and a good fit for our company culture. The context of her speech was spot on and she implemented our debrief notes into her talk. "The team were so PATIENT. I was getting frustrated going through the process of deciding and getting the right budget but the team were full of suggestions and nothing seemed too hard."